Tumors arising in the superficial lobe of the parotid are treated by superficial parotidectomy with preservation of the facial nerve. 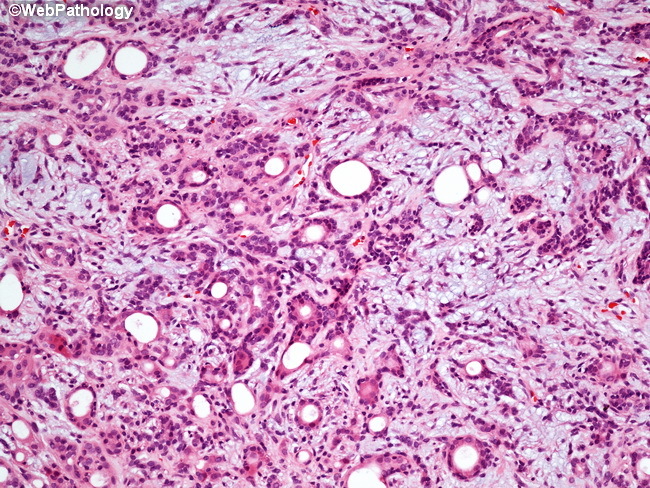 A cuff of normal salivary tissue around the tumor is always removed. With this approach, the recurrence rate is almost zero. Simple enucleation is not recommended. The recurrence rate is unacceptably high. This is due to the frequent presence of small inconspicuous satellite nodules that may be left behind with enucleation. Recurrences can occur after prolonged periods; therefore, long-term follow-up is recommended. If there is tumor spillage during surgery or if residual tumor is left behind, the patients may receive radiation. This image depicts the classic appearance of pleomorphic adenoma with admixture of all three components � epithelial, myoepithelial and stromal components.